If you saw the season eight finale of the boredom that was The Walking Dead, then proceed. If you don't want any spoilers spoiling your time-shifted viewing, avert your eyes!!! In the season eight finale of The Walking Dead, we saw something that should have happened, not happen, and a surprise form of help for Rick and the gang. But despite all of our best wishes to see Negan die by his own bat, Lucille, or some other sadistic form of death, when Rick had him on the ropes, he then had his medical people save Negan's life, while also granting a pardon to all Saviors for their part in the horrible travesties that they inflicted on the hilltop sanctuary and Rick's people. Seriously! For some reason they decided to let the murderous assholes that followed Negan, live. But the final straw was when Rick directed people to save Negan from the life-threatening injury that Rick gave him, Maggie went f*ing berserk. I was right there with her. Of course, this is Rick's way of honoring Carl's final request, about why they all can't just get along! But still, screw the f*cker, he was nasty. What's the saying, live by the sword, die by the sword? In Negan's case, the bat. The episode ended in a clandestine meeting between Maggie, Jesus and Daryl, with Maggie saying that Rick and Michonne were wrong in letting Negan live, but "We're going to bide our time, wait for our moment and then we're going to show him." Seems ominous, as if we've just set up quite the insider take-over. But we already saw a few things this season that may have hinted at this during this ho-hum, close up on the faces, season of the show. But enough about that... let's look at just one tiny thing. 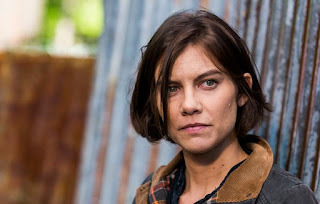 The actress that plays Maggie, Lauren Cohan, has yet to sign a new contract for the next season of the show. As if that's not slightly worrisome, she's also got a potential new show coming up on ABC called Whiskey Cavalier. No contract is one thing... we've seen last-minute deals happen. But if she's got another show, a pilot with a potential for series, how's that going to work for TWD? Rumors say that there is an agreement in place where ABC could let Cohan close out her role in TWD, but that would suggest her driven revenge mindset may not play out for her character. Many networks usually don't allow for work on more than three episodes of another show when they sign talent, unless something else was agreed upon before hand. Plus, showrunner Scott Gimple has suggested that news about Cohan will be hitting the ink soon. So... we'll see what happens!